Make sure your workspace is prepped to make onigirazu by laying a large piece of plastic wrap over a clean dry cutting board or another hard flat surface. Lay a large sheet (approximately 7 inches by 8 inches) of dried seaweed (nori) squarely on the plastic wrap.... Lightly spray the plastic wrap with the water bottle, and then sprinkle it with a bit of salt (the water helps the salt stick). 4. Then spoon some of the rice mixture into the cup (roughly 1/4 cup of the mixture). Lightly spray the plastic wrap with the water bottle, and then sprinkle it with a bit of salt (the water helps the salt stick). 4. Then spoon some of the rice mixture into the cup (roughly 1/4 cup of the mixture). 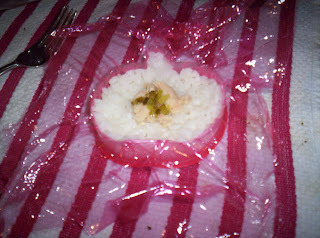 Take a piece of plastic wrap that's large enough to wrap around one portion of rice and lay it on your palm. Curl your fingers so your palm forms a shallow cup shape and scoop a portion of rice on top of the plastic wrap. Wrap tightly with plastic wrap and flip over, seam side down. The steam from the rice will moisten nori sheet and bind all the ingredients well together. The steam from the rice will moisten nori sheet and bind all the ingredients well together.